Massaman curry has to be one of the most delicious Thai curries. It’s richly textured with a coconut milk and vegetable broth base. Boldly flavored with an Indian-influenced curry paste. Full of tender potatoes and chewy [vegan] meat, and topped with crunchy roasted peanuts. It’s one of our favorite Thai curry dishes to order at restaurants, and once you try it, you’ll know why! I have to admit, this homemade version blew every previous massaman curry I’ve eaten out of the park! 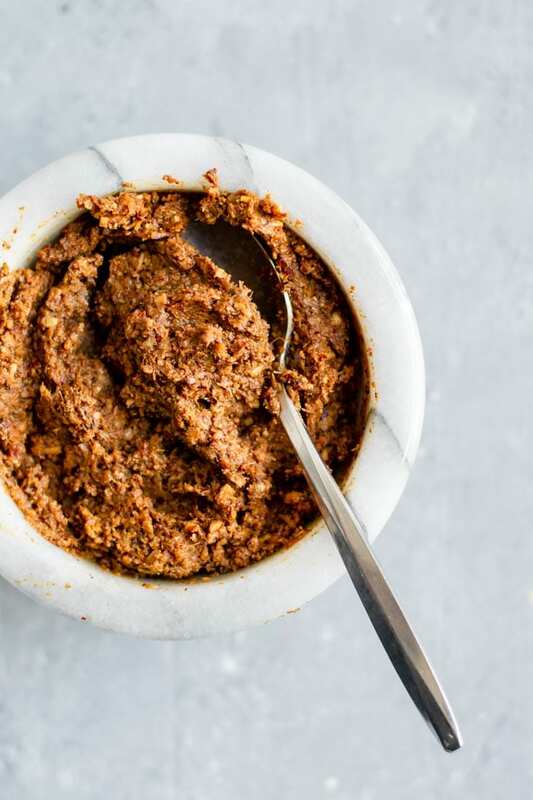 The secret is in the homemade curry paste. There’s just SO. MUCH. FLAVOR. This massaman curry is incredible! Making this recipe is easy, and quick if you’ve made the curry paste in advance! It doesn’t take much longer than the time it takes to cook the potatoes. This is not the case for the non-vegan versions of this curry, as traditionally you cook the meat (typically beef) for hours. Vegan massaman curry can be made with your choice of vegan beef, seitan, tofu, or soy curls for a delicious and flavorful plant based dish! This traditional Thai curry starts with a flavorful curry paste. Find all the details to making it in my massaman curry paste recipe, or scroll down to the end of the post to find the recipe for the curry paste. The curry paste can be made in advance and kept on hand for quick and easy massaman curry making! Make it a few days in advance and store in the refrigerator, or keep it in the freezer for longer storage. Divide it up (each curry paste recipe makes 2 batches of curry, but feel free to double or even triple the paste) before freezing for easy use straight from the freezer. If you want to make this curry from store bought curry paste, please feel free to! The spice level of store bought curries can vary, so if you are spice sensitive, start with less curry paste and add more to taste. Also be sure to check the ingredients for fish sauce or shrimp paste if using store bought. 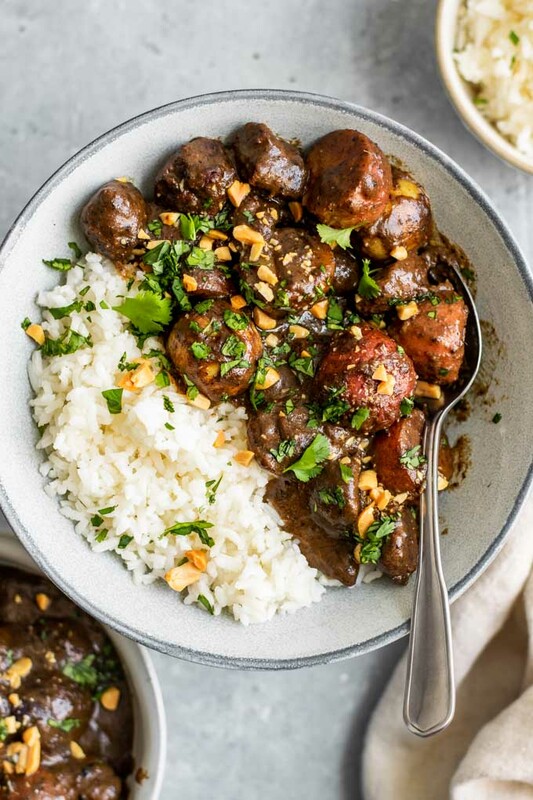 We start this massaman curry recipe by cooking the vegan ‘meat.’ It’s your choice as to which is your favorite option to use, and you can try different ones at different times! 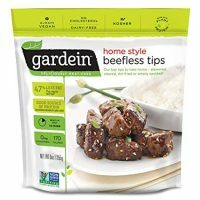 For these photos I used Gardein Beefless Tips (Amazon link), which if you like you can go ahead and use. 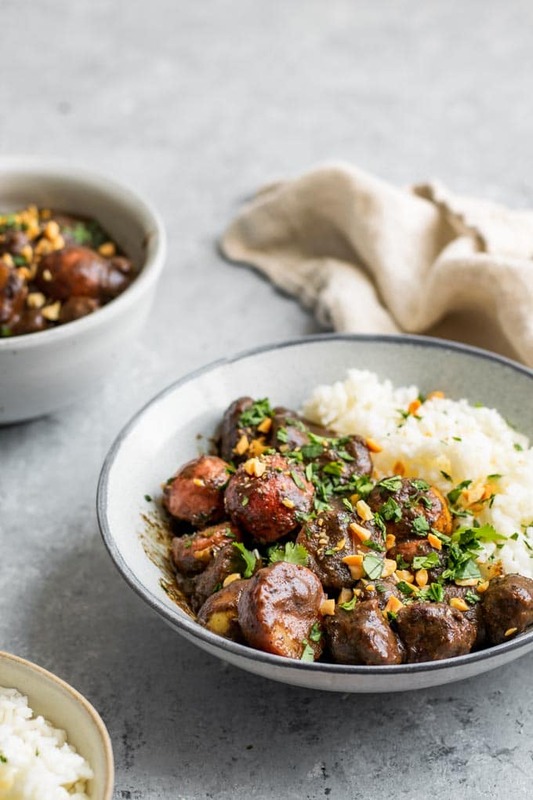 I’ll admit it’s not typically the kind of product I buy or use, the Gardein vegan beef (or similar store bought vegan beef) will make the most ‘traditional’ massaman curry. For a homemade option, try my vegan seitan steaks. Alternatively a store bought seitan or tofu would work. 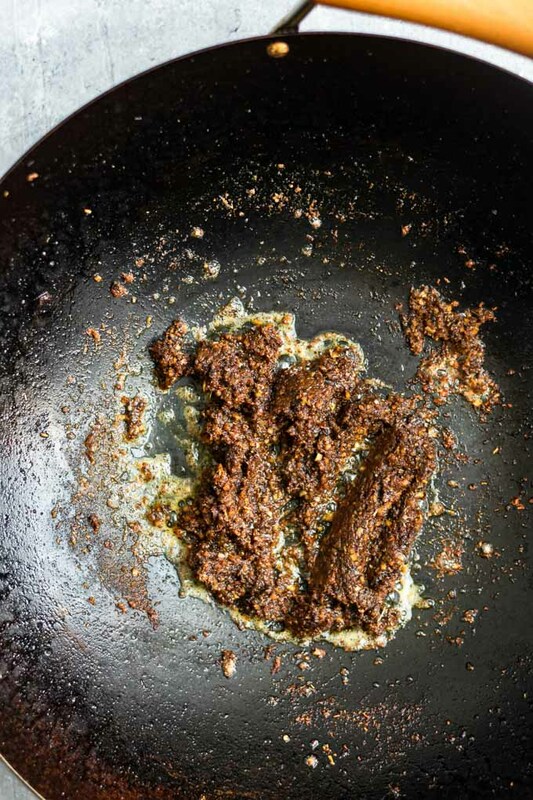 Whether you use vegan beef, seitan, or tofu, fry them in a little bit of oil in the wok to char some of the sides before removing from the heat. You could also use soy curls, which are a dehydrated soy protein product that rehydrate to a nice and chewy texture. 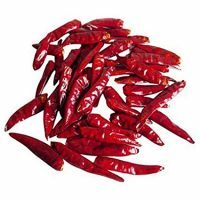 Simply soak them in boiling hot water for 15 minutes, then drain and when cool enough to handle squeeze out extra water from them. Then fry the soy curls like you would the other vegan ‘meat’ options. If using soy curls, note that they soak up a lot of liquid, so you’ll want to add more broth to your stew to get the right level of thickness. Once your vegan protein is lightly fried in the wok, remove it and start the rest of the curry. Cook the massaman curry paste in coconut cream until the cream splits to get the most flavor out of your curry. In your can of coconut milk, if the milk has separated into the creamy fat and coconut water layers, scoop out some of the cream from the top and add it to the hot wok. To this, add the curry paste. Stir them together and cook for a few minutes until you start to see the oil sizzling around the paste. This is when the coconut oil splits from the cream, and fries up the curry paste, releasing the most flavor. 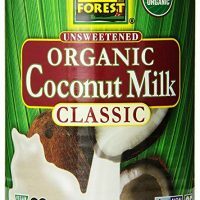 Once the oil splits, add the rest of the coconut milk. At this point, if the curry paste is a bit chunkier than you like, you can blend it with the extra liquid to make a smooth curry. Then add it back to the pot along with the broth (or water), star anise, tamarind, sugar, and the potatoes. Bring the curry to a low boil and let it cook until the potatoes are just tender. If the curry starts to get more thick add more water or broth to thin as needed. How long it takes (and therefore how much water/broth you need to add) depends on how big you’ve cut your potatoes. I left my potatoes quite large, cutting small new potatoes in half. This means they took about 20 minutes to cook. If you want it to go faster, cut the potatoes smaller! When the potatoes are just fork tender, add your seared vegan protein. Let the curry continue to cook for another 5 minutes to infuse your vegan beef (or tofu or whatever) with some massaman curry flavor. Finish the curry off by adding another 1/2 cup of coconut milk or cream for the most flavorful and rich curries. Serve the curry right away with a side of jasmine rice. Garnish it with chopped roasted peanuts and cilantro for the perfect finish! 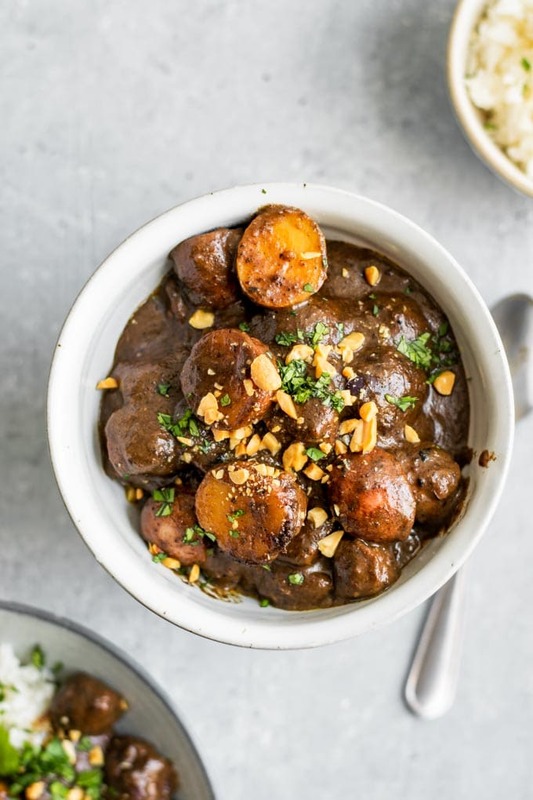 This vegan massaman curry is my husband Omar’s favorite curry, and I have to admit, one of my favorites too! I can’t commit to favorite foods, and have to hold space in my heart for all the other Thai curries, but this one is at the top of the list! 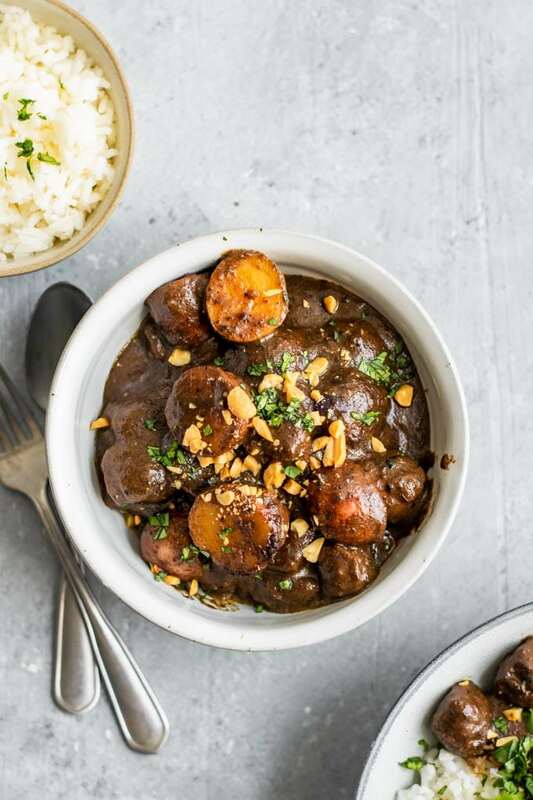 If you make this vegan massaman curry, leave a comment below and rate the recipe on the recipe card. And please share your photos with me on Instagram, tag @thecuriouschickpea and #thecuriouschickpea. I love seeing your recreations! WANT MORE DELICIOUS VEGAN RECIPES? 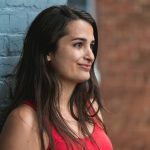 SIGN UP FOR MY EMAIL NEWSLETTERAND FOLLOW ME ON INSTAGRAM, FACEBOOK, AND PINTEREST! 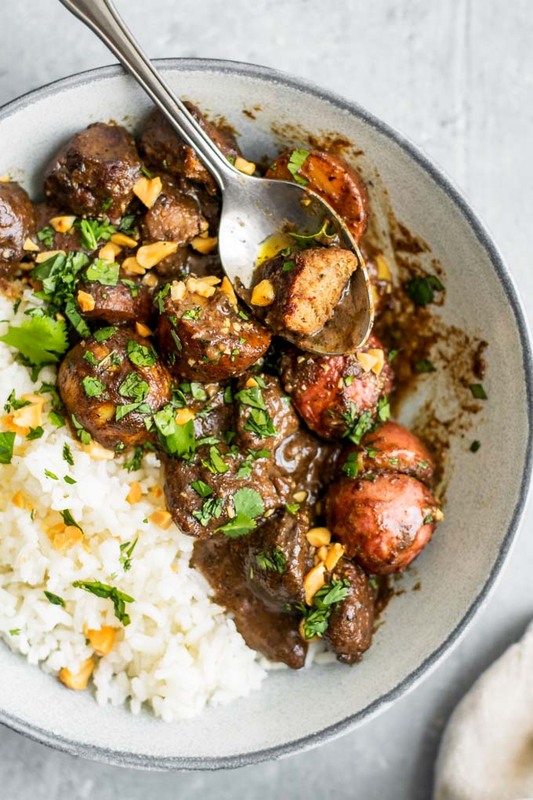 Massaman curry is a delicious Thai curry with influences from Indian cuisine. 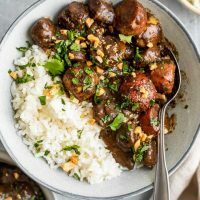 This vegan version is made with vegan beef (see post for alternatives), and is a filling and satisfying meal. Heat the oil in a wok (or pot) over medium high heat. Add the vegan beef (add straight from frozen) or seitan and fry to sear and pick up some color, ~5 minutes. Deglaze any bits stuck on the pan with a tablespoon or two of water, then transfer to a bowl and set aside. In the wok (or pot) add the massaman curry paste and 1/3 cup of coconut cream scooped from the top of a can of coconut milk. Stir to combine and let fry until the oil splits from the cream and sizzles outside of the curry paste. *If the can has not separated separated, just use the milk, it will take longer to cook down before splitting. Add the remaining coconut milk (cream + water) left in the first can, 2 cups of broth or water, the potatoes, star anise, sugar, and tamarind. Bring to a simmer and let cook until the potatoes are soft, 10-20 minutes depending on how large the potatoes are. Add more water or broth as needed to thin and keep the potatoes covered. You'll end up with a thick gravy. Once the potatoes are just fork tender, add the vegan beef back into the curry and let cook another 5 minutes. Towards the end of that cooking time, add another 1/2 to 3/4 cups of coconut milk or cream from a second can of coconut milk. Serve hot with a garnish of chopped peanuts and cilantro. Eat with jasmine rice. Use small baby potatoes (new potatoes), or yukon gold potatoes for this recipe. How large you cut the potatoes will change how long they need to cook, and therefore how much broth or water you add. Make the recipe gluten free by using tofu or soy curls for the vegan protein. See post for details. 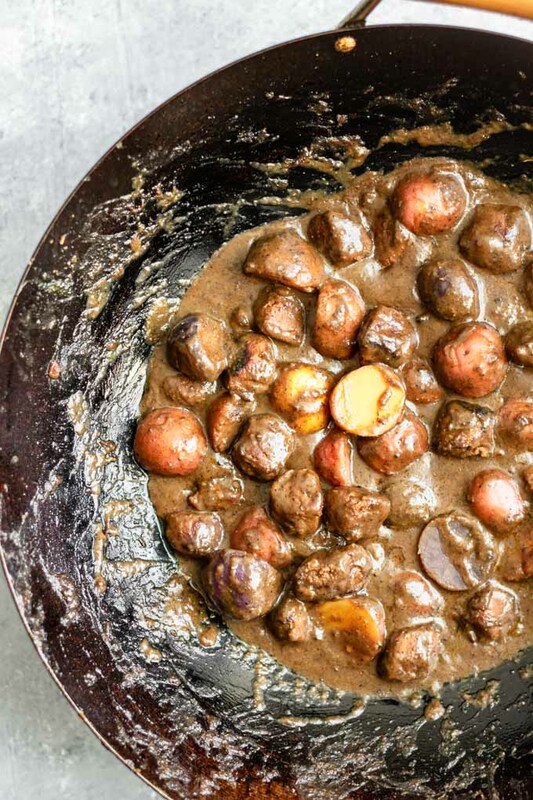 Note: if you make this recipe in a pot instead of a wok, the potatoes are likely to cook faster and the curry will not get as thick or as dark brown. You can use a bit less water and add more as it cooks to keep the consistency you want. If you cut the potatoes smaller, it will similarly cook more quickly and not be as thick or dark. 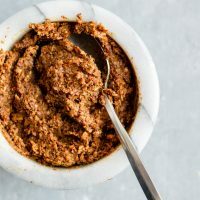 Homemade massaman curry paste is mildly spicy, a bit peanutty, and full of Indian and Thai flavors. 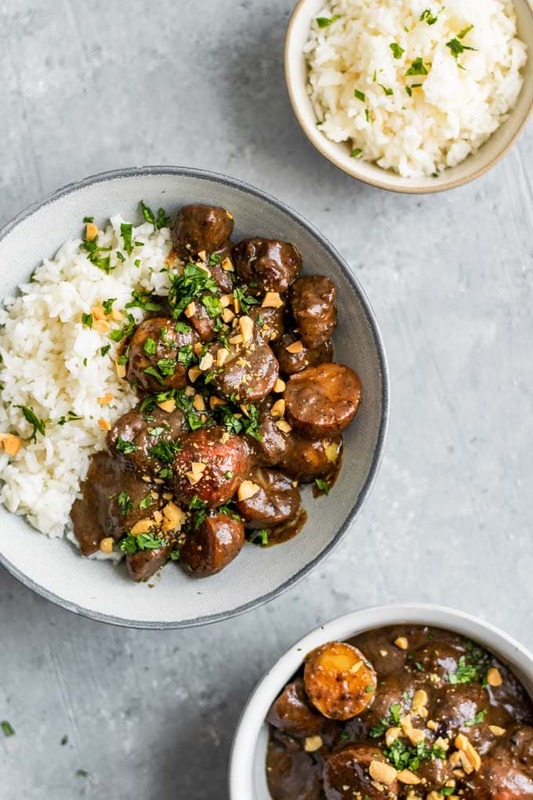 Use it to make the most flavorful and delicious massaman curry in your own kitchen! Heat a wok over medium high heat until it's lightly smoking. Add the unpeeled garlic cloves and unpeeled shallot and toast, stirring occasionally, until the skins are blackened (about 5 minutes). Take off the heat and when cool enough remove the papery skins and any part that is overly blackened and burnt. Turn the heat down to medium-low and add the whole spices: cardamom, clove, cinnamon, coriander, cumin, dried chiles, and peppercorn. Toast until fragrant, about 3-5 minutes. Remove from heat. 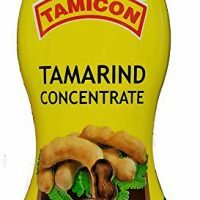 Remove the cardamom seeds from the husk and the seeds from the dried chiles. Then add all the toasted spices along with the cardamom seeds and the outer part of the dried chiles to a spice grinder or mortar and pestle (most likely in batches in the latter case). Grind to a powder. In the wok over medium heat dry roast the lemongrass and galangal (or ginger) until lightly charred, ~3 minutes. 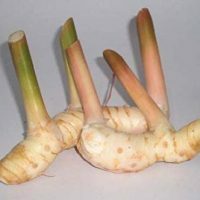 In a food processor or blender combine the peeled garlic and shallot, the ground spices, the lemongrass and galangal (or ginger), ground nutmeg, and dry roasted peanuts. Process until smooth, adding 1-4 tablespoons of water as needed to blend to a smooth paste. The smoother the paste, the smoother your final curry is. 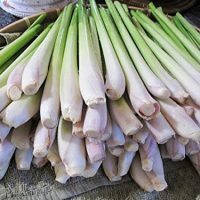 To prepare lemongrass, trim off the base of the stalk, then about 4 inches up cut off the reedy stalks. Then remove the outer layer or two of the stalk of lemongrass to expose the more tender interior. Discard the bottom and top of the lemongrass as well as these outer layers. Thinly slice the tender interior of the stalk. 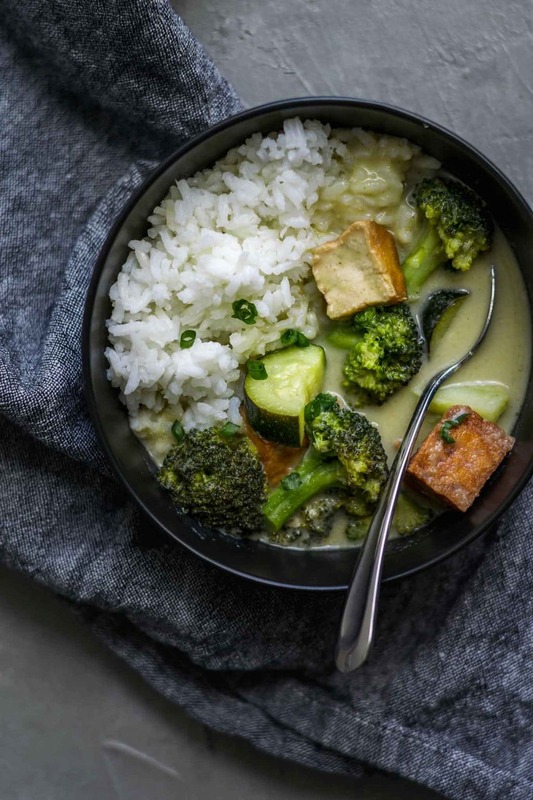 If you like Thai curries, also check out my recipe for Vegan Thai Green Curry with Tofu!